Weekends are only two working days until Monday… As I sit waiting for a callbacks and a conference meeting to start, I thought I’d share more photoshop fun. The idea was to try and capture a style of René Magritte, using my photo of the Pyramids of Giza. To achieve this I took a free template of the bowler hat man from Photographer Gavin Hoey, and then made some adjustments in photoshop. 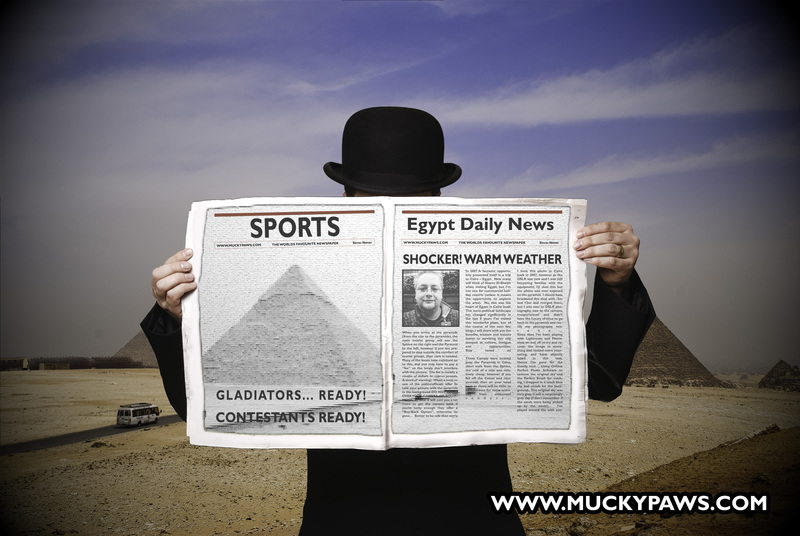 Having looked at the photo, I felt that the photo’s position on the back page of the paper (which is all part of the original photo of the Pyramids), resembled a popular 80’s gameshow. Anyone who watched Gladiators in the 80’s may remember the Pyramid Challenge where contestants tried to run to the top whilst gladiators were in pursuit and tried to throw them off. Here’s the Khafre Pyramid with its Limestone Cap, shot as wide as I could safely get that day. The story here is that the pyramids were covered in limestone to give their white appearance (obviously yellowed over time). Over the centuries the limestone was repurposed in the building of Cairo and/or sold by enterprising merchants/thieves for profit. To get a sense of scale, I’ve adjusted the photo below to bring the vertical plane to a more level part that shows people at the bottom and the sheer height of the stones. Each of these blocks of stone are at least 100 cm on each dimension, now that’s very heavy stone! Looking at the sheer volume and height of the pyramid, you get a sense of human achievement and endurance in which they raised and loaded the blocks into position, not to mention the height they have to travel. Talking to our Egyptian Guide, he claims the Egyptians are upset with Hollywood, who have over the years, made claims in film the pyramids were constructed by slaves who were never paid and lived in appealing conditions. The guide claims this to be untrue, and like any other nation, had migrant workers who would barter for their services, whether it be food, shelter or coin to work on these monuments. Either way, it’s not surprising why these stones are recognised as one of the seven wonders of the world today!